Well it seems this year I am utterly incapable of keeping a coherent chronology on this blog. Why? This model was finished around February. 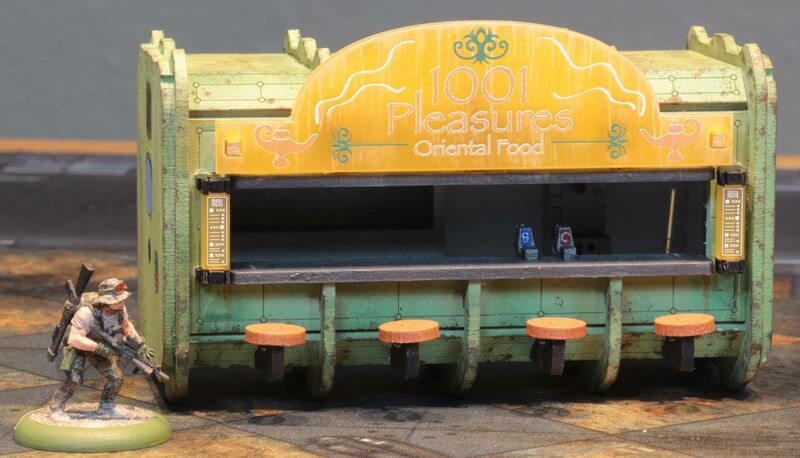 It is a fast food stall / container by Laughing Jack Games here in Germany. Nice model all around. Easy to assemble and for the amount of parts actually quite fast, too. The model itself is meant mainly for games like Infinity. Now back when I bought this model, I had planned to use it for Warzone, so I decided to do it with more of a run down look than what you usually see in Infinity. Now since then I have decided to play Infinity as well, but to be honest… I would not image the whole Infinity universe to be as shiny as you see in the concept art. There must be a social underbelly and there must be areas where those recently conquered do not live in the most shiny conditions. And this is what this container represents. I wanted to try some new techniques. So I primed the whole thing in off-white and applied coats of green ink over it with my airbrush to get a faded paint look. I like the results, but it was a somewhat strange experience and definitely needs some getting used to. Otherwise the usual chipped off paint and rust marks and it was as good as done. What I did not like was the looks of the billboard, since it simply looked too clean and new in its acrylic state. So I painted some rainwater streaks over and that did the job. Overall, I am really happy with the results. What else? I recently bought some bicycle booths from Antenocities Workshop. Nice little models. They come in their pristine MDF version, which means the MDF is covered by a protective mask while cutting. This also helped painting them, since I removed the mask over the company logos and airbrushed them before removing the rest of the mask. This was fast and created a great result. The only downside I had was this: Usually this mask is only on one side of the MDF. Since the inside of the booths looked somewhat ungainly, I airbrushed them in the base-colour. Only after assembly did I realise, that this side had been masked as well. I hope the mask never decides to come off, since that will be a royal mess to remove with everything being glued together. Last I also wanted some cars for Infinity. There are lots of really nice resin models for Infinity out there, some of which I have in queue, so I wanted something different, too. 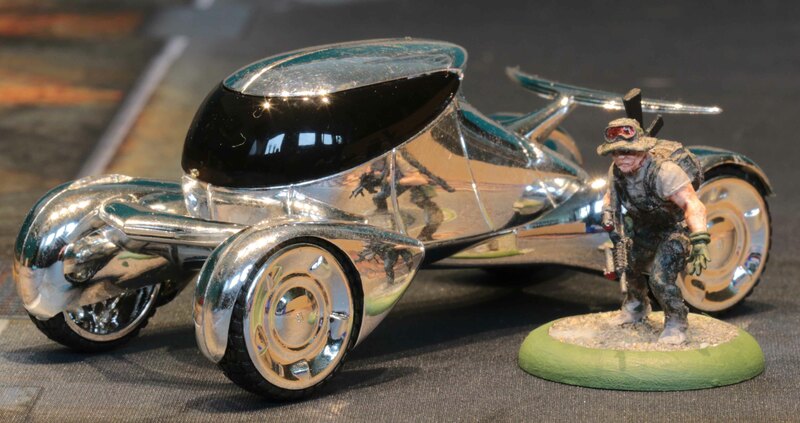 I looked at some of the 1:43rd scale models of concept cars from the big car companies. Up first is the 2004 concept for the Renault Laguna. Really liked the sleek low looks of it. But I had to laugh. 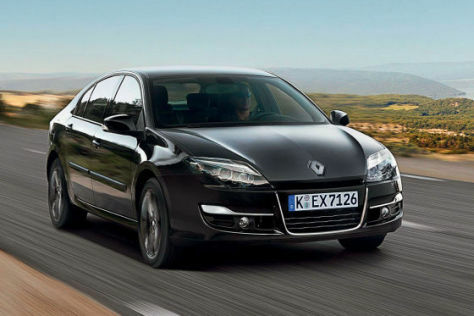 Last year Renault closed the Laguna line and replaced it with a new model, the Talisman. Looking at the last Laguna (photo included as a reference, since I know Renault does not sell in many parts of the world, including the USA), it is striking how far it still is from this concept. The other one is the Peugeot Moonster. This is a concept from 2000, trying to envision what Peugeots might look like in 2020. Suffice to say, I doubt that this is what cars will look like in 4 years time. But I really liked its organic, chrome looks for a Sci-Fi setting. This is it for today. But this also is kind of a prelude to more Sci-Fi buildings. A couple of weeks ago my Forward Base Kickstarter models have arrived and after slaving away for a couple of weeks preparing all the details to get them assembled, I have now started. so there should be more to present. One of the things that set the Second World War apart from the previous wars was the widespread use of tanks. And the fact that they were not just a slow gun platforms lumbering along with the infantry advancing on foot like they had been in the previous World War, but fast attack forces in their own right that would change the face of warfare. One of the most iconic tanks was the Panzerkampfwagen VI Ausführung B “Tiger II”, also known as Königstiger (a term actually minted by the Allied tankers and taken up by the Germans). It was a 69,7 ton monster that actually had more similarities in design with the Panther rather than the Tiger. With an armour up to 185mm thick all but a few allied tanks were unable to penetrate its armour. It was armed with a long-barreled version of the already fearsome Acht-Achter (88mm AT gun) which could take out any enemy. But it also had many of the problems of other late war German designs… mechanical unreliability and a fuel consumption that would give any ecologist a heart attack. It was also a large target with the big hull and massive turret. Only 492 were build, almost all with the Henschel turret featured on these models here. I bought the first model nearly a decade ago. 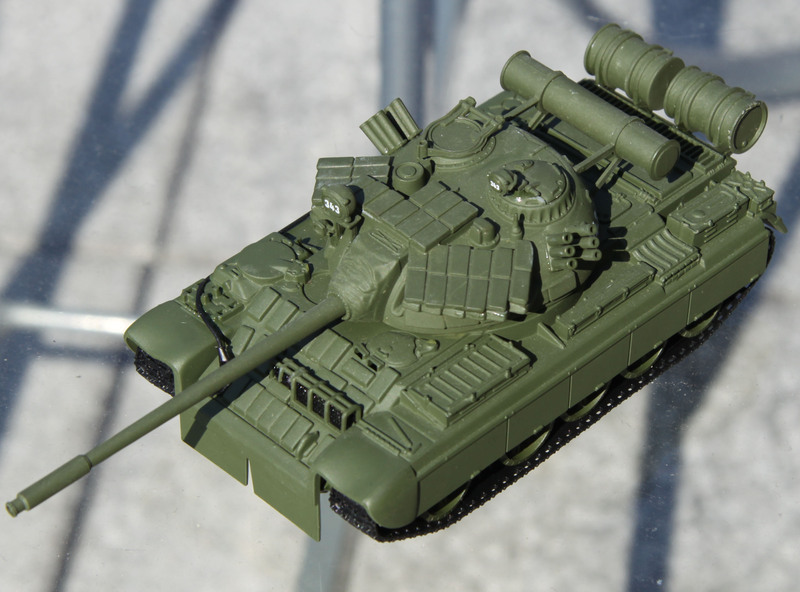 It is a solid resin model by Wartanks. The mantlet was not completely modeled to allow depression and raising of the barrel which looked a bit sad, so I re-sculpted that one using greenstuff. I did not like the paint job anyway so I did not mind repainting it. The tanker is a SS officer from Victory Force Miniatures cut off at the waist. I doubt I will ever need four of them at once, so I will most likely sell off the Wartanks one soon. In the run up to last weeks planned D-Day game (no new date set yet) I went and did some weathering on the landing craft. I have had these models since 2007, but the one thing that had always bothered me about them was that they looked too clean. So I went and did some weathering on them. Mostly rust-water stains. Anyone who has ever been on a metal ship or boat that is spending its days on the salt water seas will know that rust stains are almost inevitable. Obviously this will be less so on the big ships where constant maintenance is performed (like cuiseships or warships) and more so on those vessels where the crew is either unwilling or does not have the time to do constant maintenance. Since the landing craft for the D-Day invasion were in a lot of training use and had to undergo some rough handling as well (for larger transits or the channel crossing they were winched up the sides of warships) I decided to let them fall into the later category. 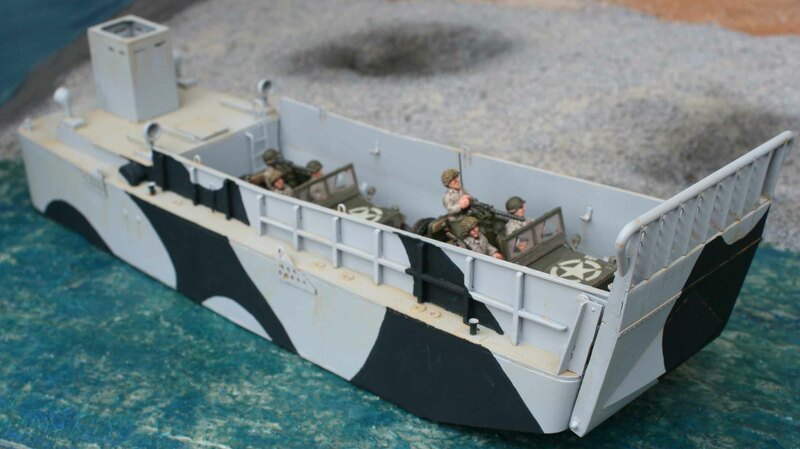 The LCA [Landing Craft Assault] was th most common landing craft used by the Commonwealth forces in WWII, filling the role for which the American mostly used the LCVP. It featured a hardboard hull, but was armoured against rifle bullets and shell splinters. It featured a 4 men crew and could carry up to 31 troops. 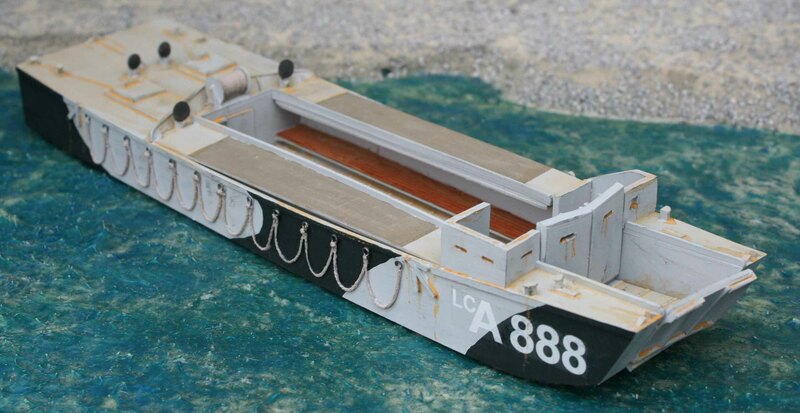 Due to its armour, shallow draft and silenced engines it also became the landing craft of choice for the special forces… like the US Rangers who used four of them to land below the cliffs of Point du Hoc on D-Day. Models are resin models from Grand Manner. I wanted them to carry the actual markings of the craft used by the Rangers (LCAs # 722, 861, 862 & 888), so I had the decals custom-made by Dom at Doms Decals. 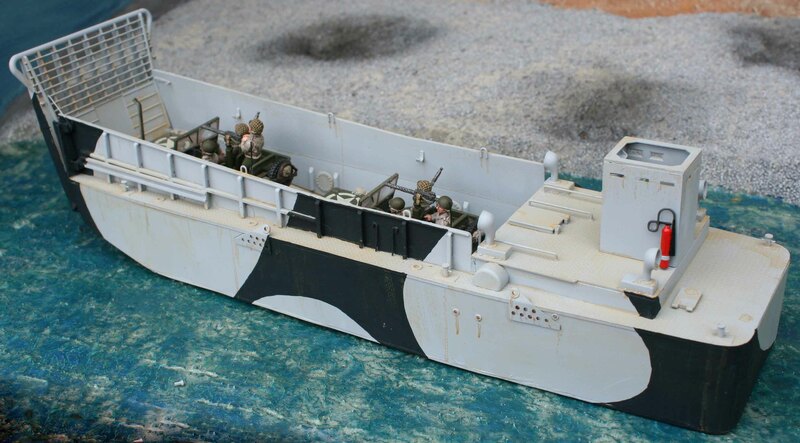 The camo of a landing craft was actually dictated by the camo scheme used on the craft they would be attached to during the channel crossing. I could not find any info on these craft here or their “carrier” so I opted for a simple dark blue over grey camo. Although none were used at Point du hoc, I also have a LCM. So while I was weathering away, I gave it a makeover as well. 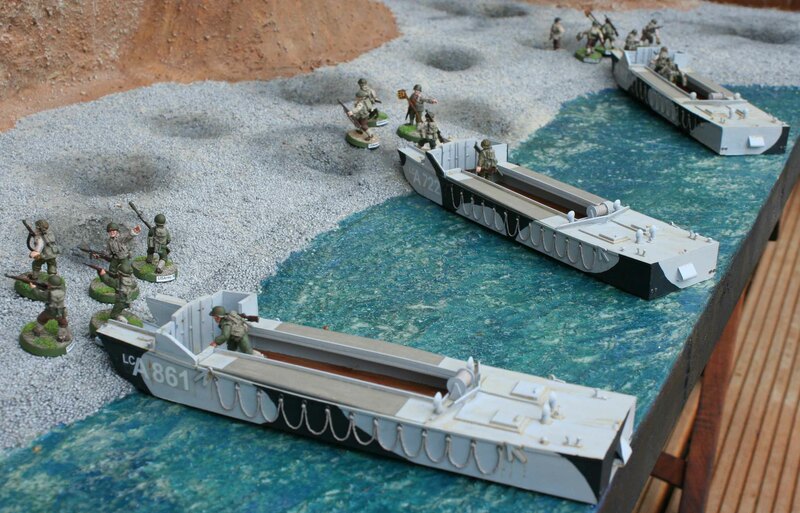 This is a LCM (3) [Landing Craft Mechanized] 1:48th scale model by Hobby Boss. It is not waterline model so I had to cut the lower hull away and replace it with plasti-card, which turned out easier than I had thought. I build it to represent the Commonwealth version (although it is used by American troops on these photos), which differs from the US version in the placement of some minor items and lacks the machine guns on the rear deck. In real life these could carry a single 30-ton tank (e.g., a Sherman), 60 troops, or 60,000 lb (27,000 kg) of cargo. After I realised, that this would be the 100th post on this blog (1st anniversary, 50.000 hits and 100th post all within 2 1/2 weeks) it was easy to decide what to post today. Something that is big, so it had to be tanks. 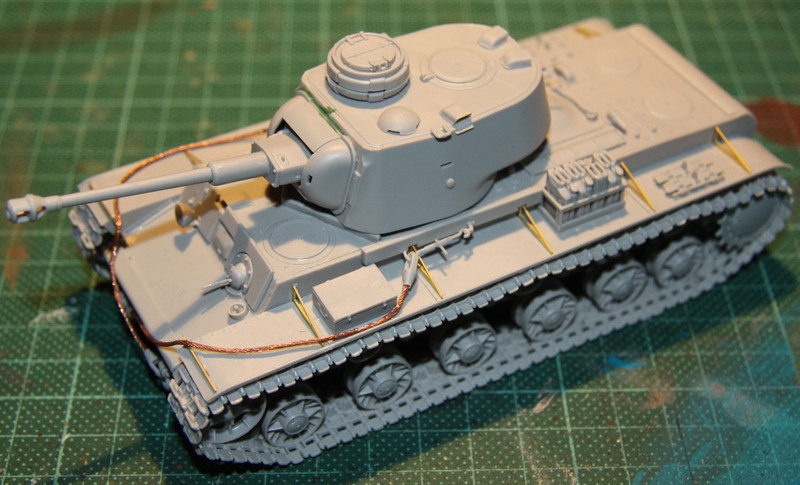 First up is a T-26. 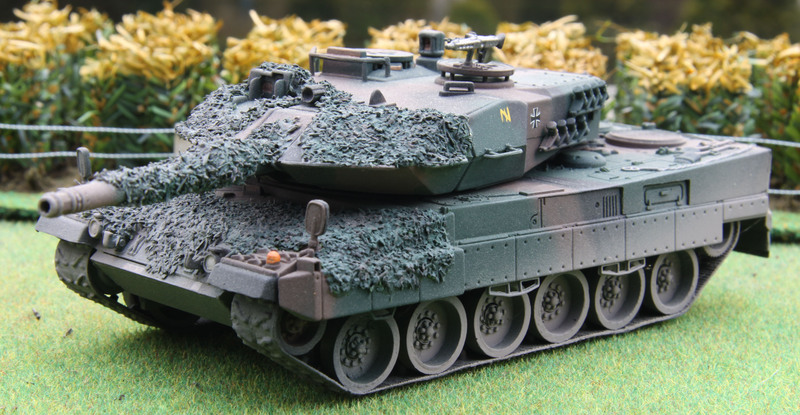 The model is a 1:56th scale from Chieftain (back when they still belonged to Crouchie) and is quiet heavy, being cast in all white metal. In reality it weighted around ten tons and was produced from 1931 till ´41. It saw use during the Spanish Civil War and with the Soviets till the end of the war. With over 12.000 (including all variants) vehicles produced it was the most successful design of the 1930´s. These are my T-70s. 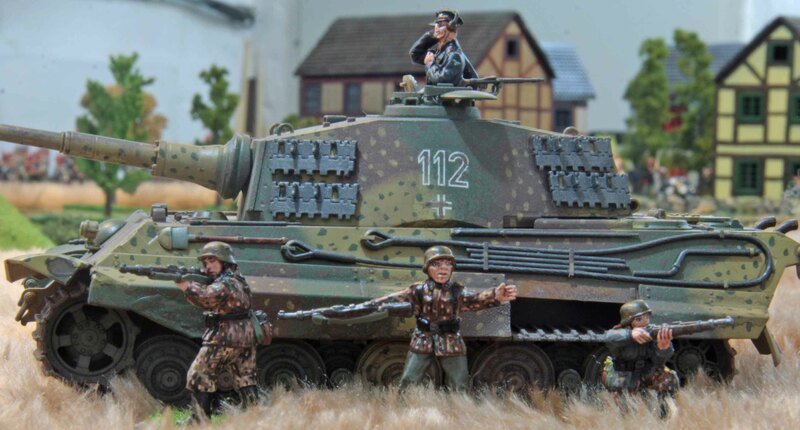 All three are JFTM / Die Waffenkammer 1:56th scale models, as is the commander. The T-70 light tank was designed as a replacement for the T-60. The Soviets had no real love for light tanks, since they were usually no faster than the T-34, but weaker in armour and firepower. On the other hand there were still a number of factories that were too small to produce T-34s and with every tank needed to defend the motherland these were used for light tanks still. The T-70 was one of them and between 1942 and ´43 8.226 were produced. With its 45mm gun it could not hope to take out a Panther or Tiger or even a PzKw IV (from the front), but it was still a serious threat to the PzKw III and lighter vehicles. Again these two are from JFTM / Die Waffenkammer, as are the crews. Design of the SU-76 began in November 1942, when the State Defense Committee ordered the construction of infantry support self-propelled guns armed with the ZiS-3 76.2mm gun. It used the basic T-70 chassis, which was lengthened by adding one road wheel per side, to facilitate better gun mounting. Just like the early T-70 models the SU-76 utilized two automobile engines, one for each track. Apart from being complicated to drive, the strong vibrations led to early failures of engines and transmission units. After producing 320 SU-76s, mass production was halted in order to fix the problems. 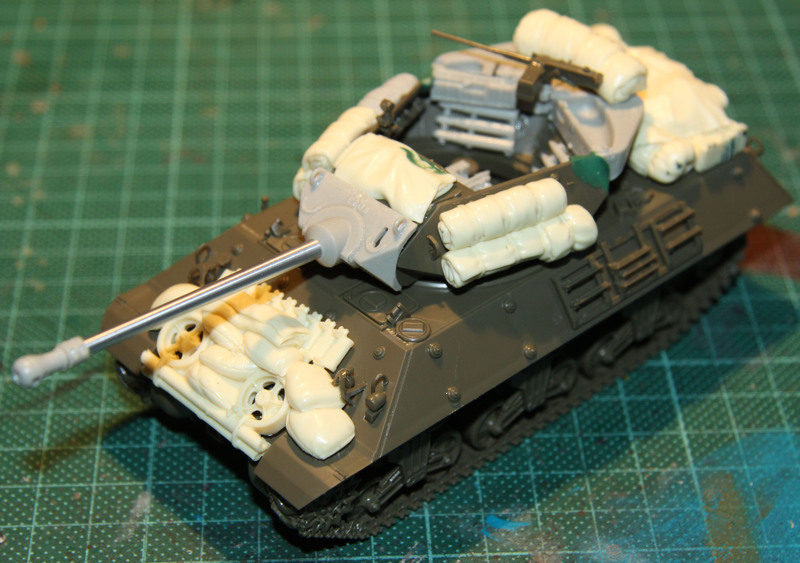 This included the change over to th single engine now standard on the T-70, as well as the removal of the roof of the compartment (the first models were completely enclosed by armour). This final version was produced till shortly after the war when they were withdrawn from service, with a total of nearly 13.000 units (making it the second most common vehicle in the soviet arsenal after the T-34). This model is a 1:48th scale Tamiya with an aftermarket conversion kit to turn it into a SU-76i. The production halt and redesign of the SU-76 was the reason for the introduction of the SU-76i. Tank destroyers of all types were in very short supply and with the SU-76 production halted and interim was needed. Approximately 200 PzKpfw IIIs and StuG IIIs were available to the Soviets, most having been captured during the German retreat from Stalingrad, and so it was decided to use these as the basis for a Soviet tank destroyer, the SU-76i. The conversion from PzKpfw III to SU-76i began with the removal of the turret, and fighting compartment roof. A new, angular superstructure was welded in place and mounted the 76,2mm gun. The guns mostly came from KV-1, which were being rearmed with the 85mm cannon at about the same time. The chassis used were from the PzKw III Ausf. H and J, the majority being Ausf. J. Since it was incapable of indirect fire (unlike the SU-76), its gun was nearing the end of its effectiveness, spare parts were hard to get and the SU-76 production was up again, these vehicles only saw a short service life, with only a few if any at all still seeing use in 1944. 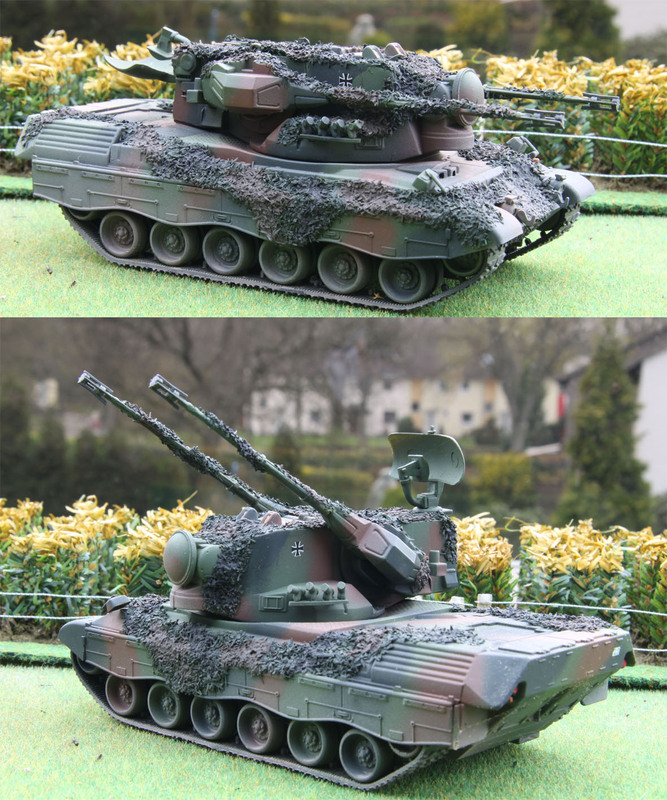 The SU-85 is a Bandai kit, the SU-122 a Tamiya, both 1:48th scale. The SU-85 was a tank destroyer based on the T-34 chassis. 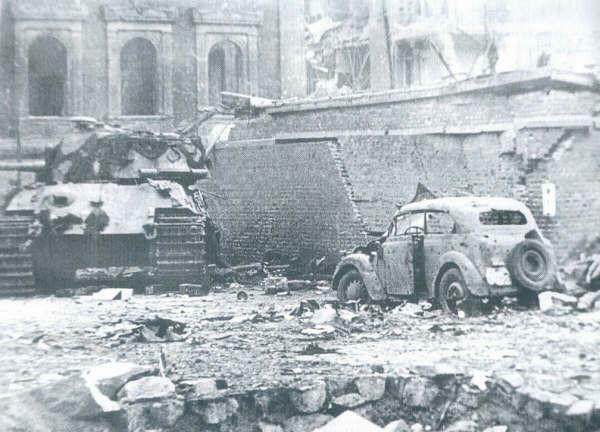 Up until late 1942 the T-34/76 and KV-1s had been able to deal with any tank the Germans had in their arsenal. This changed with the introduction of the Tiger. 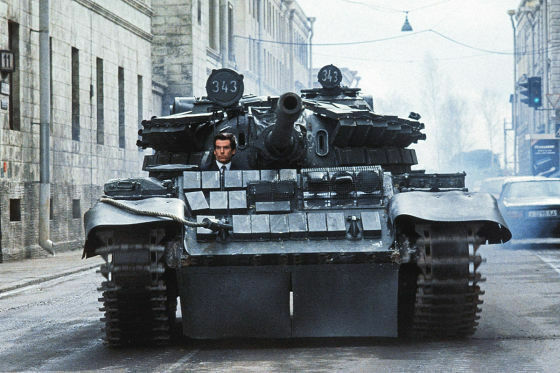 To add to this there were rumors of the Panther as well and the Soviets felt they needed something bigger. This saw the creation of the SU-85 by mating a 85mm gun with a turret-less T-34 chassis. 2.050 units were built from mid-1943 to late 1944. The SU-122 was meant to be used against installations or infantry formations. It mounted a 122mm howitzer, again on a T-34 chassis. While the gun only fired HE ammunition, it was still enough to punch through the armour on a PzKw III or IV. There are also reports the hits at very short-range were able to lift the turret of its ring on a Tiger or Panther, although they had no chance at long ranges. A total 1.150 were build between December 1942 and the summer of ´44. 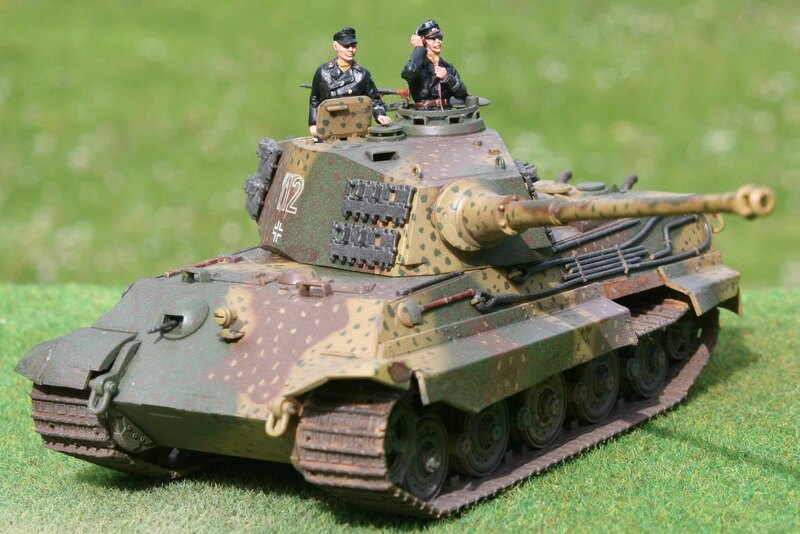 Both of these models are 1:48th scale Tamiya models, the tanker is from Bolt Action. When Germany invaded the Soviet Union both the KV-1 and KV-2 came as nasty surprises. The German high command had not expected the Soviets to have such heavy tanks and even more critical with such heavy armour. The 3,7cm and 5cm PaKs were unable to penetrate them, as were the short 7,5cm guns on the PzKw IV and StuG III, they heaviest tank mounted weapons the Germans had at that time. Often artillery in direct-fire mode or the notorious Acht-Achter Flak had to be brought up. Otherwise there are lots of tales of German Panzer trying to score immobilizing hits so that the infantry could crawl up and disable them explosives. Hardly a help for the Blitzkrieg. The KV-1 weighted in at 45 tonnes, used the same 76mm gun as did the T-34 and saw service up till the end of the war (although later up-gunned to 85mm). Total of 5.219 units were produced. The KV-2 was a monster at 53,1 tonnes. although its designation suggests otherwise, it is actually the older of the two. Only about 250 units were build. While it saw use till the end of the war, it is highly unlikely that any served in front line formations after production ceased. It was just too slow and offered an easy target with its big turret once the Germans had guns big enough to take it out. The 152mm howitzer took ages to reload and with the slow turret speed was useless against tanks. Even worse the weight of the turret was so big, that it was impossible to turn it when the tank was on anything but a mild slope. It had its good moments like on 23rd and 24th June 1941, when a single KV-2 of 2nd tank division held up the German 6th Panzer Division in southern Lithuania (near Rassaynjay town), but those were few. 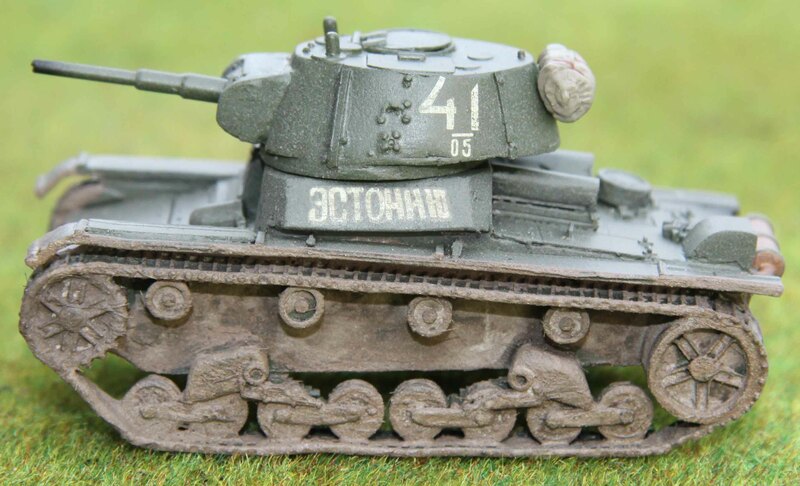 Here are another KV-1 and SU-122 in winter whitewash, again Tamiya models. I removed the boards from the KV-1. I had found a wartime photo of one like this (apparently to prevent the mud from accumulating under them when the thaw began) and I felt it looked so cool it needed to be reproduced. All three models are 1:48th scale Bandai models. I got all three quite cheap and decided to do them in a whitewash. They are usually expensive to get and are slightly smaller than the Tamiya and Hobby Boss offerings, so I decided I would not have tem on the table at the same time anyway. All these are 1:48th scale models. 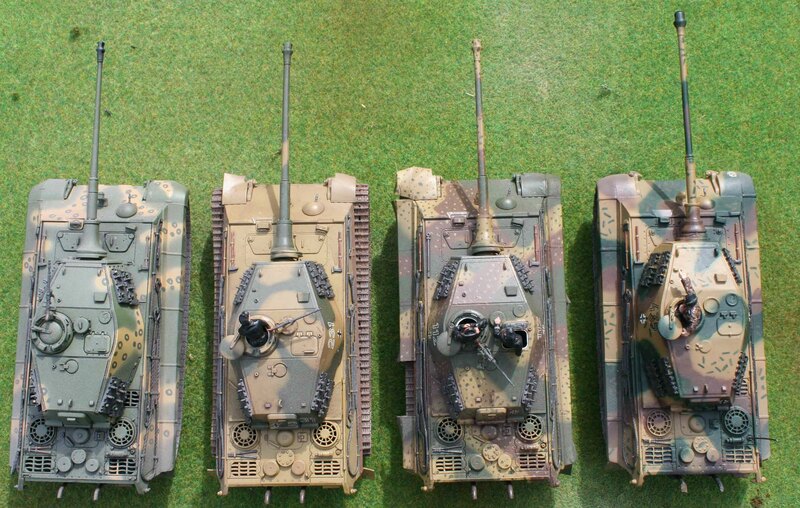 Left Hobby Boss, middle Tamiya with after market armour (Leningrad factories) and right Tamiya. The crews are Bolt Action and converted Mongrel Miniatures. Again all 1:48th scale, except for the one in the middle, which is a Tamiya with aftermarket parts and Bolt Action / Mongrel Miniatures crew, all are Hobby Boss. These two are 1:48th scale Hobby Boss T-34/85s with Tamiya T-34/76 turrets. Thess bring me up to a total of ten T-34/76 if needed! Just like the KV series tanks, the T-34 was a nasty surprise for the Germans in the summer of 1941. They were expecting an inferior enemy with inferior tanks, but found that the Soviets had a huge number of T-34s as well. While their armour was not as strong as the KVs, the fact that it was sloped set that off. So again the Acht-Achter or artillery was needed to destroy them. Against popular believe the Russians had quiet a number of them when the Germans attacked. What actually happened to these is a bit shrouded in mystery. Soviet reports state rapidly decreasing numbers, while German reports indicate few encounters with them. Which must mean that a lot of them were non-combat losses. By the time this reliability problem had been solved in 1942, the Germans had more weapons that were able to take them out though. None the less the T-34 was a great tank. Cheap and easy to build and maintain, good speed, high cross-country performance even when the muddy season began. It began the war with a 76,2 mm cannon and was later up-gunned to a 85mm. Its armour remained en-par with the PzKw IV or Sherman, and only paled in comparison to the Panther and Tiger. It had hardly any creature comforts for the crew, but proved so effective that 84.070 units were produced until production ceased in 1958. But a good number of them are still in use. The North Koreans actually had a number of regiments armed with them at th turn of the millennium and probably do so today (although most likely the 85mm version). 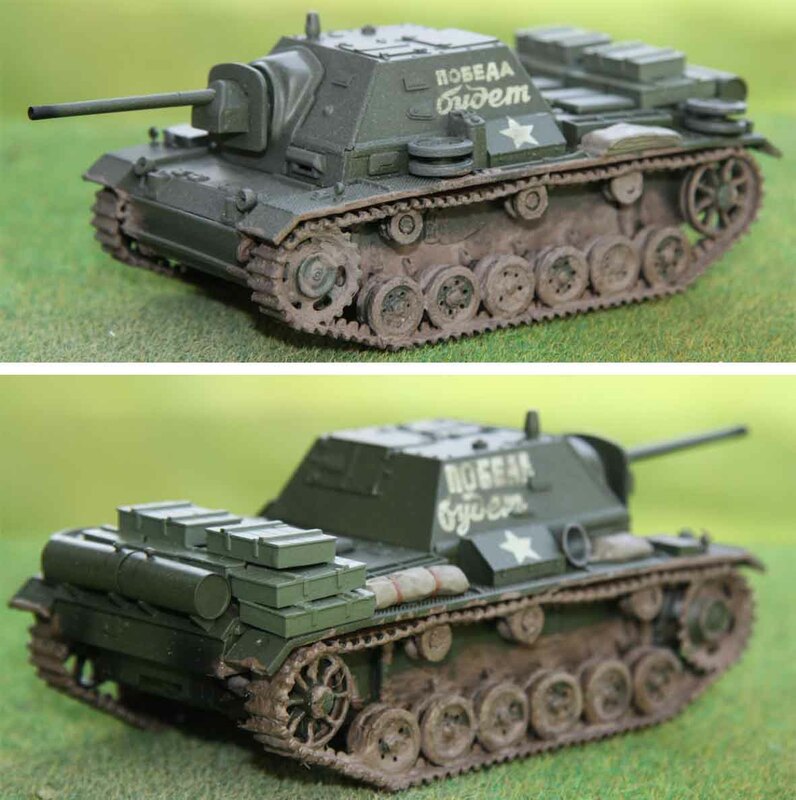 These three T-34/85s are Hobby Boss 1:48th scale models with Bolt Action / Mongrel Miniatures crew. You already saw two of them in the previous photo. I guess I might have to get myself a few more later. 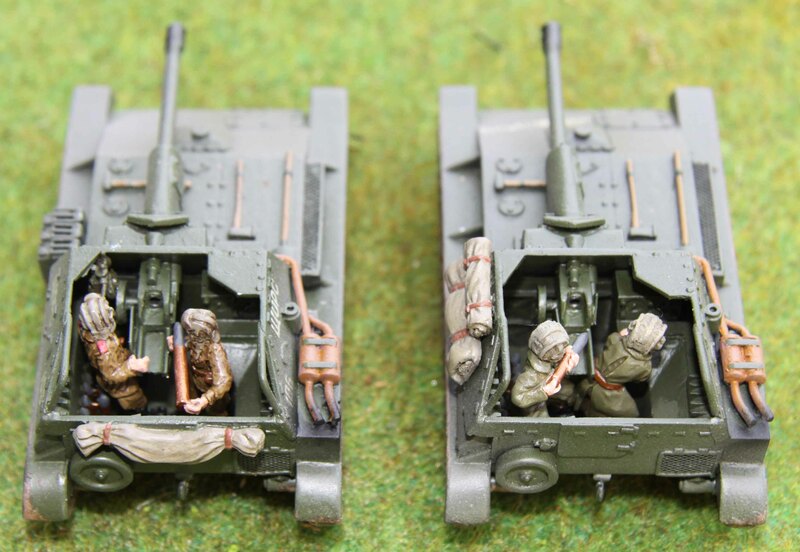 And last two 1:48th scale JS-2s from Hobby Master with a JFTM / Die Waffenkammer commander. The one on the right was repainted. The Josef Stalin tank , was a heavy tank designed with thick armour to counter the German 88 mm guns, and carried a main gun that was capable of defeating the German Tiger and Panther tanks. The JS-2 was put into service in April 1944, and was used as a spearhead in the Battle of Berlin in its intended role of breakthrough tank, firing a heavy high-explosive shell that was useful against entrenchments and bunkers. But its massive 122mm main gun was also more than capable of taking out the mighty Tiger II. A total of 3.854 units were produced and used till 1995 (although I suspect North Korea still uses hers). And this is it… my Soviet armour. just to give you a parting shot… here they are all together. 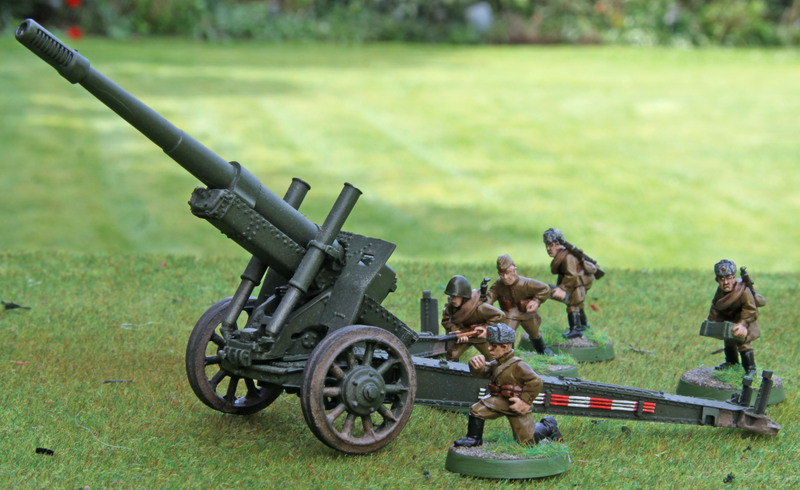 And no this is not 15mm FOW, this really is 28mm!!! P.S. : I managed to set up the “Categories” listing the way I wanted it after all, so feel free to browse a little through the older entries. After all the Kursk AAR´s last week I wanted to give you an overview of the WWII Soviets I actually have. Lets start today with guns big and small and the soft skinned vehicles. 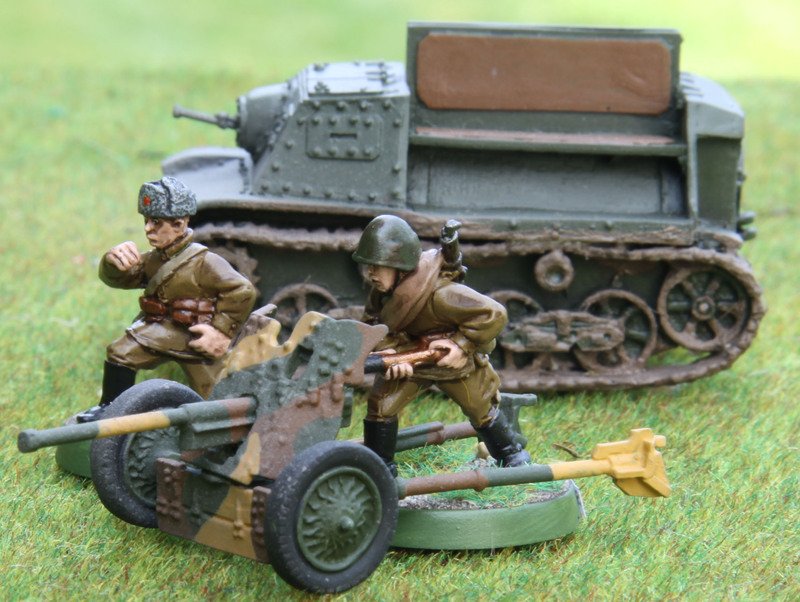 This is a M1937 45mm anti tank gun with crew and Komsomolets tractor. 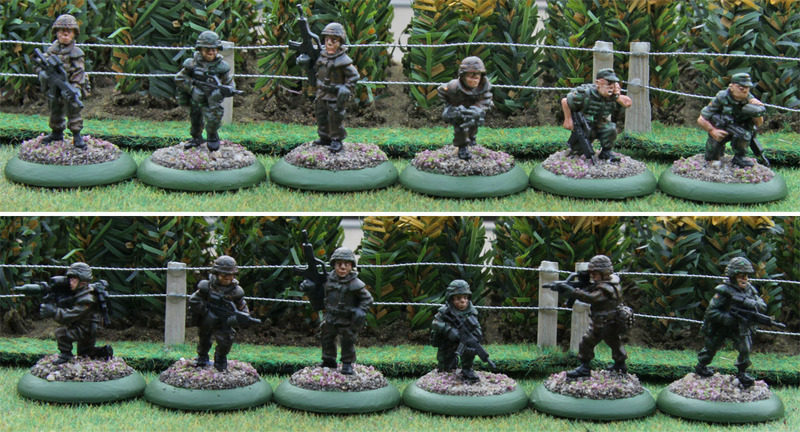 All the models are from Bolt Action. The gun itself was developed in 1937 (hence the name) based on the German 37mm under a license bought from Rheinmetal, only with a larger calibre. Not that it was much more effective against armour then it´s German counterpart and was replaced in 1942 with a longer barreled version (which again ceased being effective only one year later). The T 20 “Komsomolets” tractor was designed to tow light artillery pieces such as this 45mm anti-tank gun and the 120mm heavy mortar. 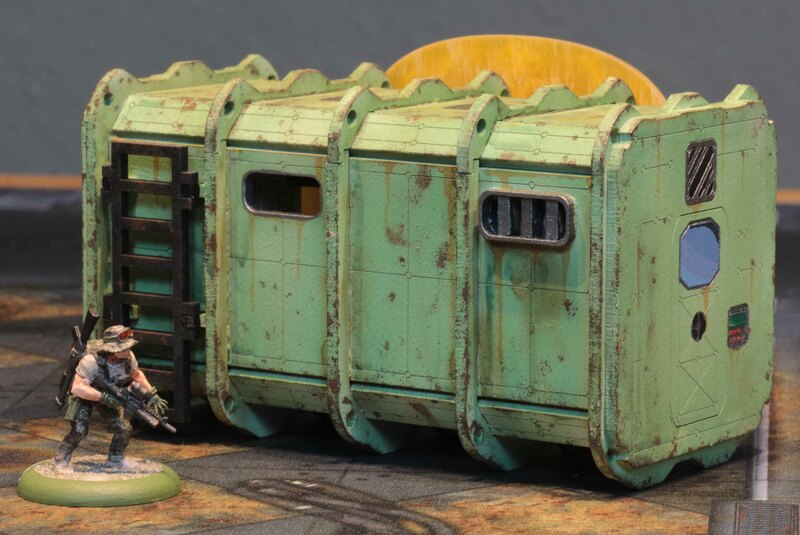 It could tow the weapons themselves plus a small quantity of ammunition (in a limber that is unfortunately not supplied with the Bolt Action model) and up to six crewmen. The fully armored forward compartment provided space for the driver and vehicle commander and had a ball-mounted DT machinegun. The rear compartment held the gun crews, seated back-to-back in outward-facing bench seats. These are three ZIS-3 guns. Again the guns and crews are Bolt Action. I hope one can tell from these pictures (all pictures are thumbnailed to larger versions btw. ), but the one on the left has a winter whitewash. I actually have a fourth gun, but that will be pressed in German service. The ZIS-3 was a combination of a 76,2mm gun and the carriage from the ZIS-2. While it was constructed in 1940, it had not entered service by the beginning of Operation Barbarossa (the German invasion of the Soviet Union). Germany had fooled Soviet intelligence into thinking that its tanks had armour strong enough to withstand 76mm rounds, so the Soviet had no interest in these types of guns and the developer hid the prototype from officials. When the Soviets found out, that even lighter guns were able to dispatch the German tanks in use in 1941 this changed and in the end over 103.000 were produced. The Germans called it “Ratsch-Bumm” (“Crash-Boom”). Due to th high velocity of the round the report and the sound of the projectile hitting were almost simultaneous, which led to the term. 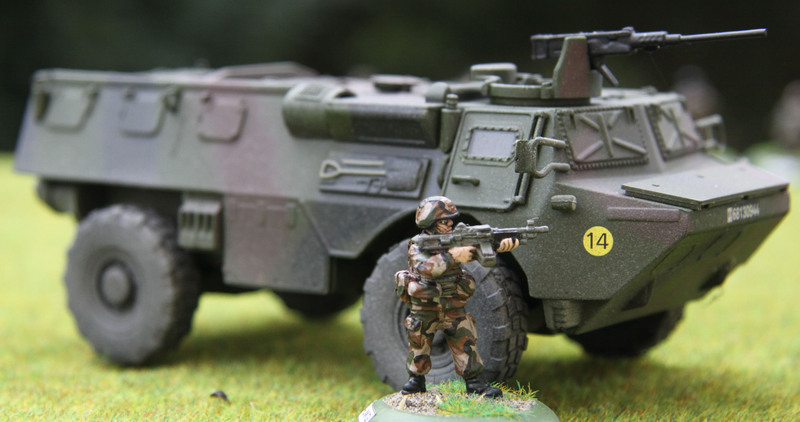 The model itself is a 1:48th scale Gaso.Line model with a Bolt Action crew. Nearly 7000 M1937 152mm howitzers were build and served till the end of the war. The gun itself also saw use on the SU-152 and ISU-152 assault guns as well. These are two GAZ 76B. They are Schuco die-casts straight from the box and only weathered with dust and mud. 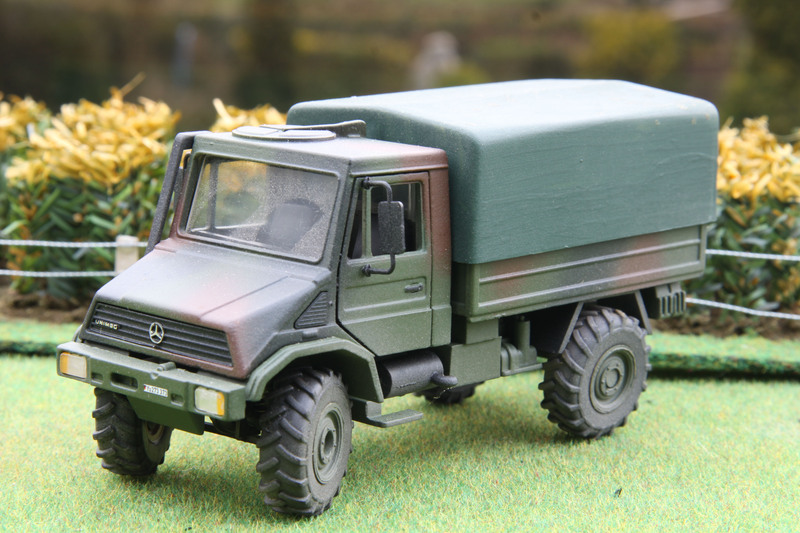 And last but not least two 1:48th scale GAZ AA. These are UM-Models and were quiet horrible to build. Very brittle plastic and lots of flimsy parts. Surprising enough, they are quiet robust once assembled and stand up to the rigors of gameplay. Tomorrow shall either be the tanks or infantry (I have not decided yet). I have to admit I was getting a bit fed up with all those dark blue from my French Nappy Marines (I am still positive that I will finish the last battalion in time for the competition deadline). To get a little break and get some more room in my “to do pile”, I assembled some WWII tanks. All the models are 1:48th scale. Except for the grey ones (which are from Hobby Boss) all the others are Tamiya. As you can see I slapped quite a few after market resin pieces on, to give them a battlefield look, plus some extra track links I bought from Tamiya. 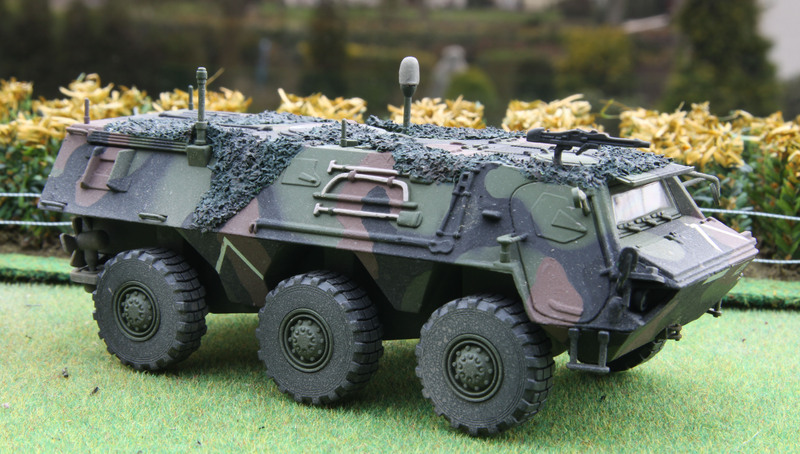 The Achilles TD is a Tamiya M10 kit with an aftermarket conversion kit. Those Shermans with a matt finish got a test coat of paint a few weeks ago. I have a to say I am not too happy with the way the colour turned out. It is missing a bit of an olive hue, which I want for my British tanks. I got Vallejo British Bronze Green Polyurethane Primer the other day and I am keen to see how that one turns out. So I shall keep you posted! 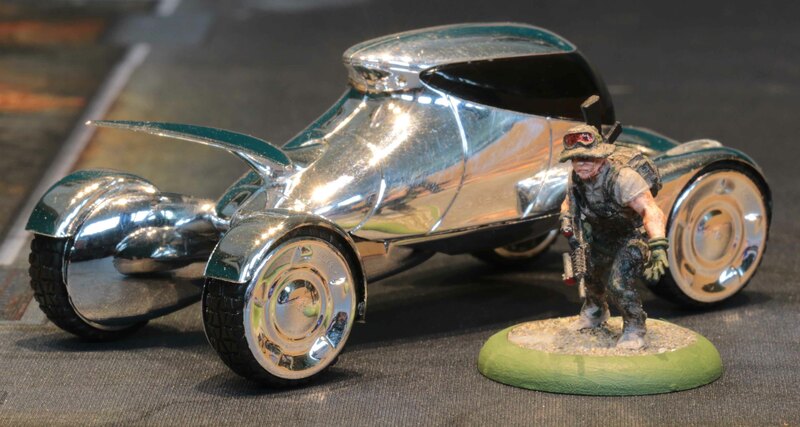 Once I get my Cromwells, scout cars and M3 assembled they shall be painted. Over the past few days I needed a slight break from Napoleonics. 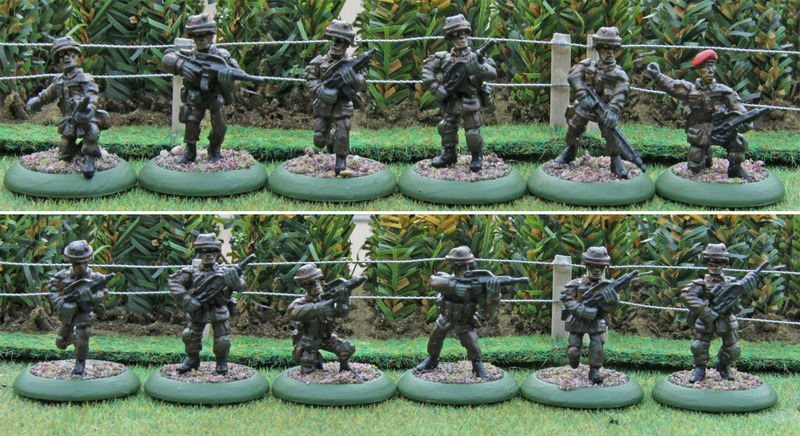 Amongst other things I finished the AT team and the vehicles for my modern French, thus completing the unit. Some words on them first. I wanted to be able to use them together with my modern Germans, so I decided to have them depict men from the “Deutsch – Französiche Brigade” / “Brigade Franco – Allemande”. In that sense they wear the blue barrets of the Brigade. Since the French fighting units of the Brigade are the 3ème Régiment de Hussards and the 110ème Régiment d’Infanterie and their vehicles are quiet light. So I chose two Véhicule Blindé Léger [VBL] and one Véhicule de l’Avant Blindé [VBA] for them. 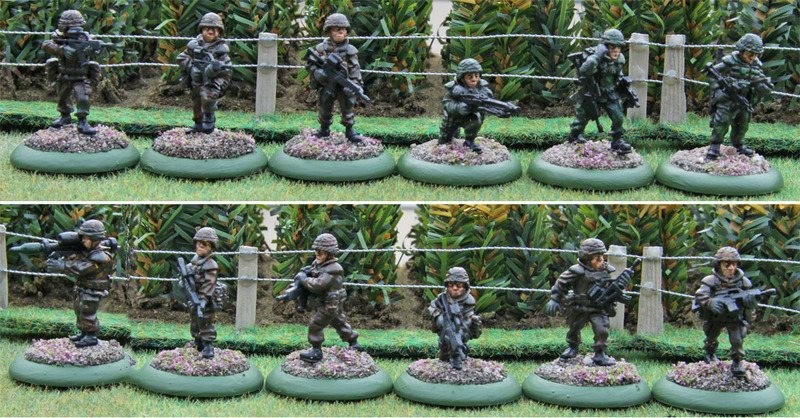 While the former is part of the HQ or Recon elements, the later is part of the infantry elements. None the less I did not feel that they would not appear on the battlefield together, so I shall use them side by side. The models themselves are Schuco die-casts. I touched up some parts and airbrushed some dust on, but that was it. One of the VBL´s got a Milan launcher and spare rocket from Eureka. Before you ask… yes it fires to the rear on the real life vehicle as well (now I can see jokes coming there). Now on to the infantry. The minis are a mix of Dadi & Piombo (D&P) and Eureka Miniatures. I have to say I liked the later better. D&P only have four poses and just the basic squad weapons. 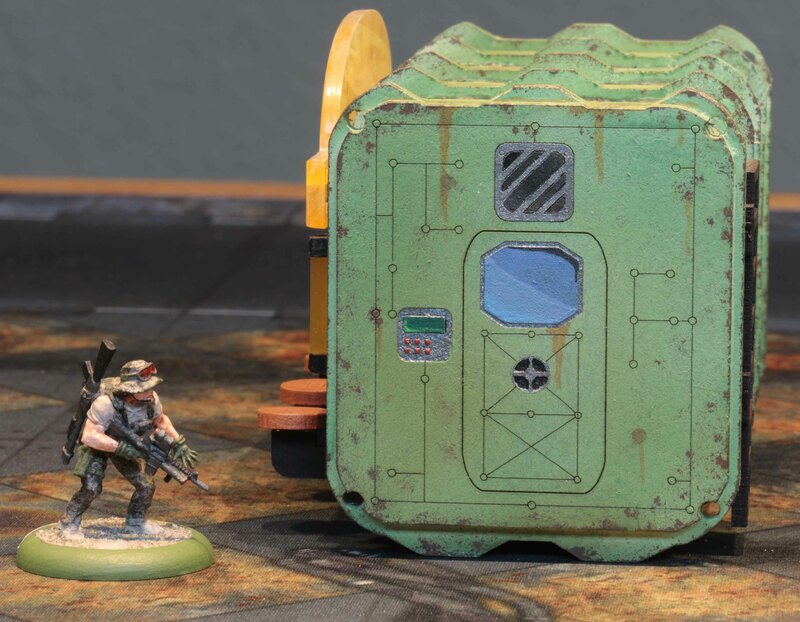 The Eureka minis have more variation, mortars, rocket launchers… and they feature more kit, giving them a real life look. Sizewise they mix real well though, so I did not care too much. Now all the minis aboce are Eureka. I am going to mark those by D&P accordingly.